Don’t wave at me and smile. The heading to this post are the words that I shouted out today as I rode through a busy junction in South East London. I wasn’t rejecting unwanted greetings from friendly passers by. I was actually responding to some very irritating driver behaviour. And that’s unusual for me. I tend not to comment on the behaviour of other road users even when that behaviour impacts on my safety. Not because I am possessed of a super calm zen that propels me stress-free through life, but rather because years of London riding has made me realise it’s not really worth the stress. And also, to be honest, the awareness of my own propensity, every now and then, to behave like an absolute prat. But today, I did lose it a bit. You might be wondering just why I would object to a driver waving and smiling at me. That doesn’t sound so terrible, does it? 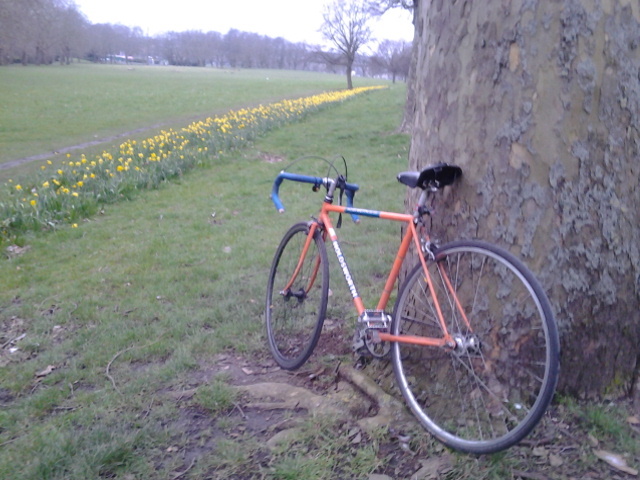 I was riding over the junction of Nunhead Lane with Peckham Rye East, heading up the Rye. There are two lanes of traffic heading across the junction. The left hand lane is for traffic going straight ahead or making that left turn. I was plonked dead centre in that lane to head straight on. As I moved forward, a van behind, overtook in the right hand lane then performed a perfect left hook on me. The driver seemed to raise his hand as I braked sharply, while moving slightly to the left to avoid a scrape, and he gave me, a wave, rueful half smile and shoulder shrug. It seemed like a gesture of gratitude mixed with apology that I’ve often received from drivers performing that kind of manoeuvre and it is extremely annoying. I’d rather they just carried on as though they hadn’t even seen me. At least that would be some kind of excuse for endangering the safety of another human being. But to acknowledge you, means they knew exactly what they were doing to you. They were prepared to risk your life or limb just to gain a few seconds in busy traffic and they think that a friendly wave signifying thanks and sorry mate, somehow makes it an acceptable thing to do. However, I managed to keep my cool for this one. My uncharacteristic loss of temper came a second or so later. I resumed moving through the junction, but halfway across, another car, on the other side of the road was waiting patiently, indicating to turn right from the Rye on to Nunhead Lane, and then seemed to morph in a second from highway code observing motorist to mad stock car racer and accelerated across my road space. Less than a minute after the first incident I had to slam on my brakes for a second time, stopping dead in the middle of the junction. And as she passed, that driver made that same stupid gesture, an apologetic smile, a gentle, rueful wave, a gentle shrug of the shoulders. That’s when I shouted the words heading this post. I was not angered so much by the manoeuvres themselves, dangerous, selfish and irresponsible though they undoubtedly were. It was the implied suggestion in that friendly shrug, that silly wave and half smile that the drivers gave, that it’s just one of those things, a trivial bit of naughty behaviour that I would excuse and understand, because, after all we’re all only human. That gesture makes me feel like I am a mild annoyance to those drivers that can be swatted aside like an irritating insect on a summer’s day. And that was the cause of my angry outburst. So, any suggestions for how people riding bikes can make drivers like those described above, realise that we are real human beings with as much right to road space as they. I have been making myself feel better with hot tea, biscuits and the devising of evil, but humorous, ways to punish errant motorists. So, ideas gratefully received.